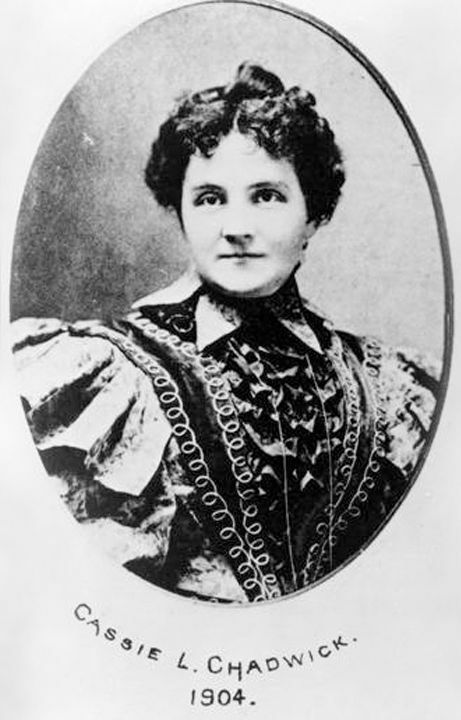 Cassie L. Chadwick was born Elizabeth Bigley in Eastwood, Canada on 10 October 1857. In 1879 she was arrested for forgery at Woodstock, Ontario, but was released after convincing authorities that she was insane. In 1882 she married Wallace Springsteen at Cleveland, Ohio, but the marriage ended after 11 days when he discovered her background. Five years later, as Madame Lydia DeVere, she became a clairvoyant and hypnotist. The lure of criminality was too much and in 1889 Cassie was jailed for nine and a half years for forgery. Paroled after four years, she opened a brothel and married a gullible, wealthy man, Dr Leroy Chadwick, in 1897. That year she went to the home of multi-millionaire Andrew Carnegie with a lawyer called Dillon, a friend of her husband, who waited outside in the car while Cassie went in. She spent half an hour inside the mansion and, as she left, waved to a man who looked like Carnegie but was in fact his butler. Back in the car she conveniently dropped a piece of paper. When Dillon opened it, it turned out to be a promissory note of $2 million, bearing Carnegie’s signature. Swearing Dillon to secrecy, Chadwick claimed to be the illegitimate daughter of the industrialist and philanthropist. It was not long before the word was out and banks fell over themselves to offer Cassie millions of dollars in loans — various estimates put the figure at between $10 and $20 million. Cassie spent the money as fast as it was offered, once spending $100,000 on a party. She bought so many jewels that she became known as “the Queen of Ohio”. The edifice came tumbling down on 2 November 1904 when the H.B. Newton Bank of Boston called in a loan of $190,800 and Cassie was unable to repay the money. She was arrested at the Hotel Breslin in New York on 7 December 1904 and returned to Cleveland where she stood trial. Leroy Chadwick divorced his wife and fled to Europe. On 10 March 1905 Cassie Chadwick was fined $70,000 and sentenced to 14 years in prison. She was sent to the State Penitentiary at Columbus, Ohio on 1 January 1906. She was not to serve her sentence; she died in prison on her 50th birthday. When she was arrested in New York, Chadwick was sitting in bed wearing a money belt containing $100,000. Her mansion on Euclid Avenue, Cleveland was demolished and is now the site of the Liberty Hill Baptist Church.